Obama tells business leaders the country "cannot afford inaction or delay"
WASHINGTON (CNN) -- The House of Representatives on Wednesday passed President Barack Obama's economic stimulus package, sending the $819 billion bill to the Senate, where it will face more opposition from Republicans. 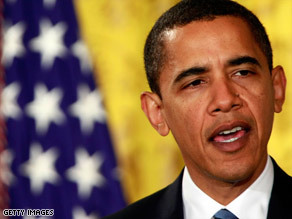 Preisdent Obama says his economic plan will create or save up to 4 million jobs. The 244 to 188 vote was mostly along party lines, with 11 Democrats voting against the package. The Senate is to take up the bill next week. "I hope that we can continue to strengthen this plan before it gets to my desk," Obama said after the vote. "We must move swiftly and boldly to put Americans back to work, and that is exactly what this plan begins to do." Hours before the vote, Obama told a group of business leaders at the White House that the country "cannot afford inaction or delay" on the economy at a time when people "are looking to Washington for action -- bold and swift." Obama was seeking corporate America's support for the stimulus package. Obama said the federal government can "help create a favorable climate in which workers can prosper, businesses can thrive, and our economy can grow. And that is exactly what the recovery plan I've proposed is intended to do." "Most of the money we're investing as part of this plan will get out the door immediately and go directly to job creation, generating or saving 3 to 4 million new jobs. And the vast majority of these jobs will be created in the private sector -- because, as these CEOs well know, business, not government, is the engine of growth in this country," he said. Obama and House Democrats etched out plans for a broad-reaching package in the weeks leading up to the president's inauguration, and two House committees have amended and modified the provisions for about $550 billion in spending and about $275 billion in tax cuts over the past two weeks. The stimulus bill's approval in the House on Wednesday was no surprise, because Democrats have an overwhelming majority there. House Speaker Nancy Pelosi, D-California, on Tuesday called the bill "the most important piece of legislation Congress will vote on this year," arguing that it supports jobs, tax cuts and accountability to taxpayers. "This Democrat bill won't stimulate anything but more government and more debt," said Rep. Mike Pence, R-Indiana, on Tuesday. "House Democrats [will] use a time of national crisis to fund big government priorities under the guise of stimulating the economy." Obama called for bipartisan cooperation on the bill and met with House Republican leaders Tuesday in an attempt to gain support across both sides of the aisle. "I don't expect 100 percent agreement from my Republican colleagues, but I hope that we can put politics aside," he said after the meeting. On Tuesday, key Senate committees took up the Senate's separate but similar version of the bill. Next week, the full Senate will vote on its version. Should the Senate and House pass different versions, the two bills would have to be conferenced together. Then, both chambers would have to vote on the new conference version in the coming weeks. Analyst Tim Speiss, head of the Wealth Advisory Practice at Eisner LLP, said he believes the final bill will closely mirror the House's more expensive version, saying provisions that the Senate excluded are likely to be put back in after a compromise. "You may see a horse trade, but [the final bill is] going to look more like the House plan, with only fringes of what the Senate modified," Speiss said. Congress has put the legislation on a fast track, as many lawmakers agree that fast action is needed to help pull the economy out of a deep recession. Democratic leaders have said they aim to get the bill to Obama's desk for him to sign before Congress' Presidents Day recess in mid-February. Even opponents of many of the Democrats' proposals have said a compromise is likely to be reached by that deadline. "There's unanimity that our economy needs help," House Minority Leader John Boehner of Ohio said Friday. "And there's also a desire to move a package that would help rescue our economy, help American families, small businesses, entrepreneurs and the self-employed." CNN's David Goldman and Deirdre Walsh contributed to this report.